This is a book of spiritual life lessons — not taught, but rather, lived and shared. It is a story about hope, courage, and simple faith. The hope and courage were developed during the author’s childhood which was spent overcoming the effects of polio. The support of a loving family helped her to focus on her opportunities and not the obstacles she was facing. The simple faith began in the Catholic church and grew, as she did, to embrace universal traditions of spiritual life. Adulthood brought Lloyd a happy marriage and she began to think of her life as blessed. She had two children, went to college, and became a social worker. Then, in the 1990′s, post-polio syndrome reared its head and life changed for her again. As is often the case, Reiki entered her life unexpectedly as she battled post-polio syndrome. It was not something she sought out. She welcomed it into her life. Soon both she and her husband were Reiki practitioners. Together they began a journey of healing that continues to this day. Lloyd’s physical condition began improving, gradually, not quickly, but consistently. Her spiritual world changed as well. 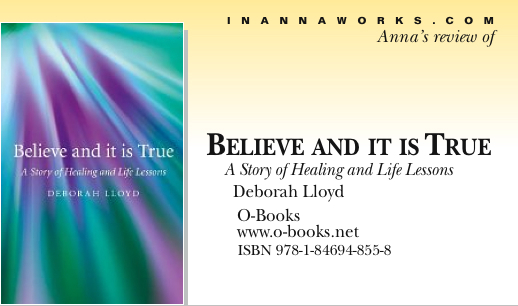 This entry was posted in Anna's Books of Interest, O-Books. Bookmark the permalink.